Rum base, raisins, milkfat, nonfat milk,sugar, corn syrup,buttermilk, whey, mono & diglycerides, guar gum, cellulose gum, disodium phosphate, calcium sulfate, polysorbate 80, locust bean gum, carrageenan, gelatin, artificial flavor, natural color, vitamin A, palmitate. Who knew that rum and raisins would be the perfect ingredient to create our most popular and decadent ice cream? 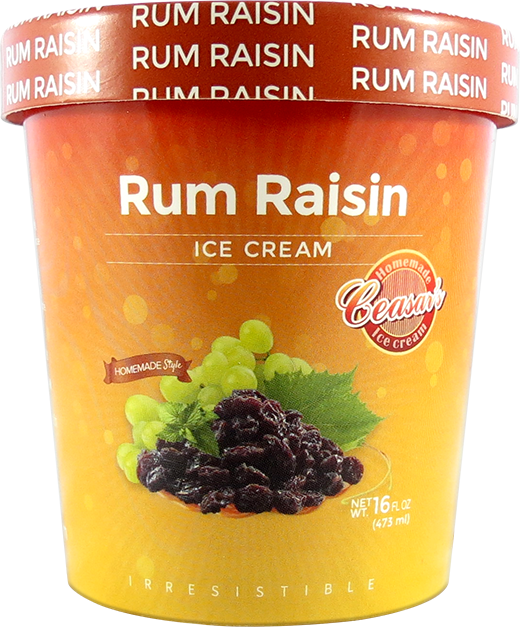 Every single scoop contains just the right amount of plump, juicy raisins combined with a hint of rum flavor that makes your tastebuds go wild. Its simplicity, aroma and smooth consistency instantly evokes happiness and joy. Our homemade style rum raisin ice cream is simply irresistible, and its characteristic flavor creates a sense of warmth and satisfaction. Let its dreamy flavor take you on a magical adventure with every bite.